The National Highway Traffic Safety Administration (NHTSA) has issued a consumer safety advisory regarding counterfeit airbags. These airbags, which the NHTSA says are installed at third party repair shops, can malfunction and jeopardize the lives of vehicle occupants in a crash. According to the NHTSA, car owners who have been in a crash may have had their airbags replaced with counterfeits. The counterfeit parts look like original equipment, right down to fake manufacturer logos. However, the counterfeit airbags are not made to the same standards as genuine parts, and have consistently malfunctioned in tests. In a crash, these fake airbags may not deploy, or they may expel metal shrapnel if they do. In one test, an airbag separated from its mounting point, showering the vehicle occupants with sparks from the bag’s pyrotechnics. While it does not know the full scope of the problem, at the moment the NHTSA estimates that a very small number (0.1 percent) of American vehicles have counterfeit airbags. 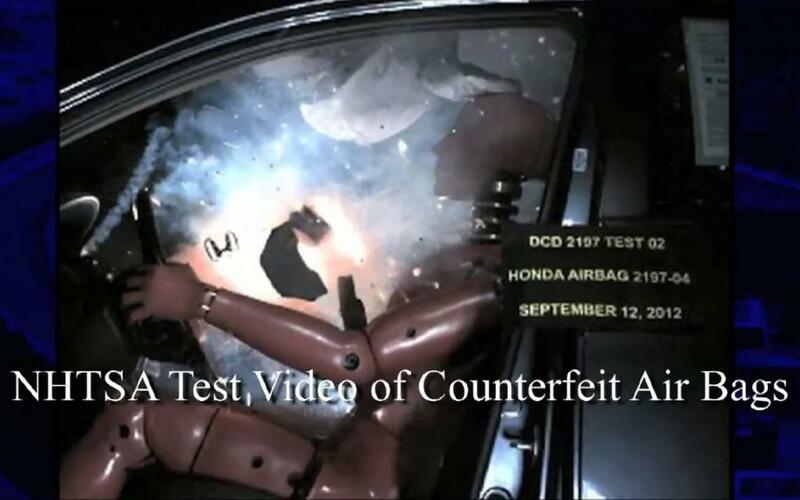 The NHTSA is not aware of any deaths or injuries due to counterfeit airbags. The NHTSA is urging consumers whose vehicle has been in a crash within the last three years, and who have had the airbags replaced by a shop that is not part of a new car dealership, to call the manufacturer and have the replacement parts inspected. The safety advisory also applies to anyone who bought a replacement airbag online. If the manufacturer finds a counterfeit airbag, vehicle owners will need to have it replaced at their own expense. Consumers who purchased their cars new and have not been in a crash, and people who own a used car that has not had its airbags replaced in the last three years, shouldn’t have anything to worry about. The NHTSA is advising all consumers, even ones whose cars do not appear on this list, to have their vehicles inspected if their airbags have been replaced in the last three years. In addition, a vehicle may not have counterfeit airbags just because it is on this list, it just means the NHTSA has found counterfeits made for that model. A full list of manufacturer call centers is available at the NHTSA’s website.